How can crowdsourcing help users manage their privacy setting in location-based applications? Our new paper answers this question with new algorithms and users studies. The paper, “Crowdsourcing privacy preferences in context-aware applications” is about to be published in Springer’s Personal and Ubiquitous Computing Journal. You can download the paper directly or go to its journal’s page. Developers of context-aware applications are faced with a tough challenge: powerful privacy controls are essential to maintain user trust, but they are also hard to use and not adequate in all situations. To address this tradeoff, we present Super-Ego, a crowdsourcing framework for privacy management of location information in ubiquitous environment. We study how crowdsourcing can be used to predict the user’s privacy preferences for different location on the basis of the general user population. The crowdsourcing methods are evaluated in a 2-week user study in which we tracked the locations of 30 subjects and asked them to provide privacy preferences for the locations they had visited. 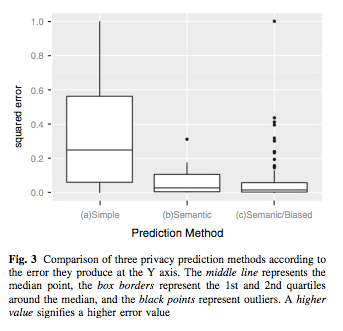 Our results show that by employing simple methods for semantic analysis of locations and by profiling the user’s privacy inclination, our methods can accurately predict the privacy preferences for 80% of the user’s locations. By employing semi-automatic decision strategies, which ask the user to decide regarding the privacy of some of the locations, the accuracy rate raises to 90%. 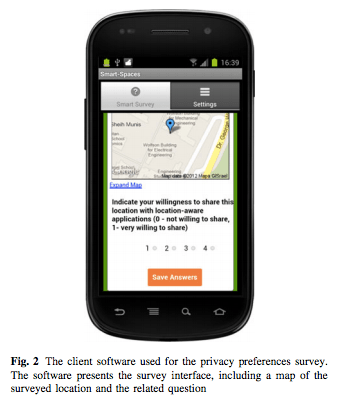 Toch, E. (2012) Crowdsourcing privacy preferences in context-aware applications. Personal and Ubiquitous Computing, Springer, Berlin.